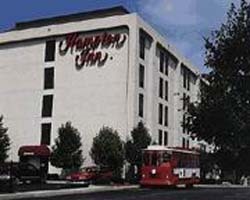 Hampton Inn Chicago Midway Airport is conveniently located just a short distance from Chicago MDW in the Midway Hotel Center. A shuttle service runs between the airport and the hotel 24 hours and downtown Chicago is a train ride away from the nearby CTA station, accessible via the shuttle service. Nearby companies include General Electric, Cintas and WR Grace and there are plenty of restaurants nearby for guests searching for a bite to eat. Nearby Bedford Park has a great selection of restaurants which the hotel’s staff can guide guests to and in the morning feast on the complimentary Hampton On The House Hot Breakfast, available as a sit-down option or on the go in a bag. High-speed internet is offered in all guest rooms as are the following amenities: work desk, TV, music alarm clock and extra comfy bed. Travelers can book larger rooms with king-sized beds should they require extra space. In the hotel, there is an ATM, florist, room service and luggage hold. Business guests may want to consider the event facilities offered, there is a meeting room, photocopying services, business center and AV equipment rental. For exercise, guests can use the on-site gym, complete with modern equipment and machines. With meeting space of more than 600 square feet the Hampton Inn Chicago Midway Airport is an ideal base for meetings, conference, events or even weddings. A shuttle service runs between nearby Chicago MDW Airport and the hotel 24 hours a day and it is located close to the I-55 for drivers coming from or driving to the south-west and loop areas of Chicago. Nearby attractions include Tootsie Roll, the famous candy sellers, just a mile away and the Cog Hill Golf Course.